Whether building organs or maintaining healthy adult tissues, cells use biochemical and mechanical cues from their environment to make important decisions, such as becoming a neuron, a skin cell or a heart cell. Scientists at UC Santa Barbara have developed a powerful new technique that reveals for the first time the mechanical environment that cells perceive in living tissues—their natural, unaltered three-dimensional habitat. "Knowing how cells respond to mechanical cues in the living embryo and how they physically sculpt tissues and organs in the 3D space will transform the way we think about developmental processes," said Otger Campàs, a professor in the Department of Mechanical Engineering at UCSB and senior author on the paper that reports this novel technique in Nature Methods. "Importantly, this knowledge will help us better understand healthy tissue homeostasis and the wide range of diseases that involve abnormal tissue mechanics, especially cancer." The growth and development of a living organism is a choreography of cellular movements and behaviors that follow internal genetic guidelines and specific biochemical and mechanical signals. All these events conspire over time to create a variety of complex forms and textures that make our tissues and organs functional. 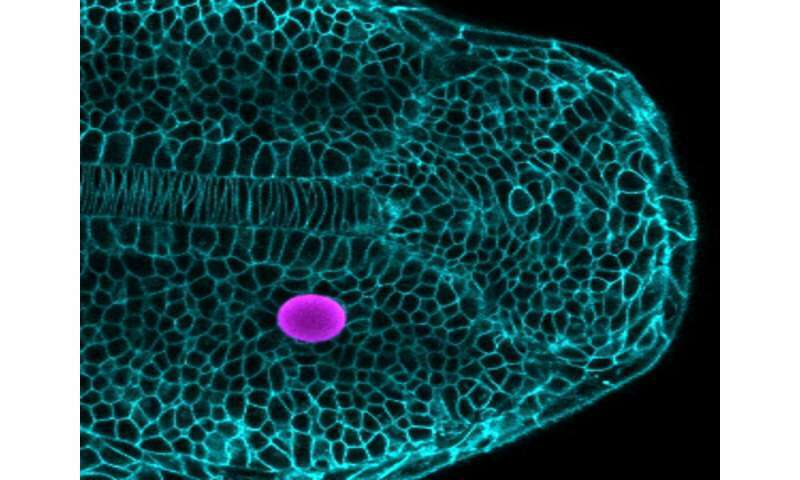 Scientists have focused for decades on the role of biochemical cues in embryonic development, Campàs said, because no techniques existed to measure the mechanical cues that cells are exposed to during the formation of tissues and organs. "We know that the mechanical environment of cells is important," explained Campàs, who holds the UCSB Mellichamp Endowed Chair in Systems Biology and Bioengineering. "Growing stem cells on synthetic surfaces with different levels of compliance showed that stem cells would become a different cell type depending solely on the mechanical environment they perceive. If you put embryonic stem cells on a substrate like Jell-O—mechanically similar to brain tissue—they turn into neurons. But if you put them on something harder, similar to embryonic bone, they turn into bone-like cells." Until now, scientists did not have a method for studying the mechanical characteristics of native cellular environments—that is, cells surrounded by other cells and matrix scaffolds within living tissues. As a consequence, it was not possible to know how cells respond to the mechanical cues they perceive as they build tissues and organs. "The technique we developed allows the measurement of the mechanical properties such as stiffness and viscosity within living tissues," said author Friedhelm Serwane, who is currently at the Max Planck Institute for Intelligent Systems in Stuttgart, Germany. "This is exciting because important cell functions are controlled by those mechanical properties. If we can measure the mechanical properties within living organisms now we might be able to understand better how this relationship between mechanics and biology works." Key to this method are tiny magnetically responsive droplets inserted between cells in the developing embryo. When exposed to a magnetic field, these magnetic droplets deform, pushing on nearby cells. By carefully controlling the composition of the droplets and the strength of the magnetic field, the forces applied by the droplet can be controlled, and the response of the surrounding tissue reveals its mechanical characteristics as well as the cues that cells are exposed to as the tissue grows. This technique is complementary to a previous methodology developed by Campàs and colleagues that revealed the forces that cells apply to each other in growing tissues. The scientists applied their new technique to study how the vertebrate body axis is mechanically built. Using embryos of zebrafish, which was selected for its rapid development and optical transparency, they could show that the mechanical properties of the tissue change along the body axis, facilitating the extension of the body at its posterior end. Inserting magnetic droplets at different locations in the tissue, and generating forces by applying a magnetic field to the droplets, the researchers showed that the tissue behaves like a fluid while growing, with similar mechanical characteristics as thick honey. The data showed that the tissue is more fluid at the posterior end where it was growing, and becomes less fluid far from the growing region. "It is similar to glass-blowing," said Campàs. "The tissue is more fluid in growing regions and 'fixes' its shape by becoming less fluid where it does not need to expand." The scientists' findings have wide implications in the effort to understand how organs are sculpted into their shapes and how cells respond to their native mechanical environment both in healthy tissues and during disease. The Campàs lab is studying several of these questions, including how limbs are built and how mechanical changes in tumors affect the behavior of malignant cells and the growth of the tumor.